Farmers Market Friday is well underway and we are getting everything ready for market Saturday morning and in the controlled chaos that is the farm I tend to get tunnel vision and missed out and what people are doing with our fresh produce and herbs. Laci McGee and her blog McGee Travel Tales has featured the farm in multiple posts and is a wonderful farmers market conversation with her, her boyfriend Keltin, and of course her pup Bear. Check out one of my favorite blog posts here she posted on Foodie Friday in her McGee Travel Tales blog about our Harvest Box that we bring to the The Clearfork Farmers Market every Saturday. Laci created a simple healthy breakfast with produce from the market. 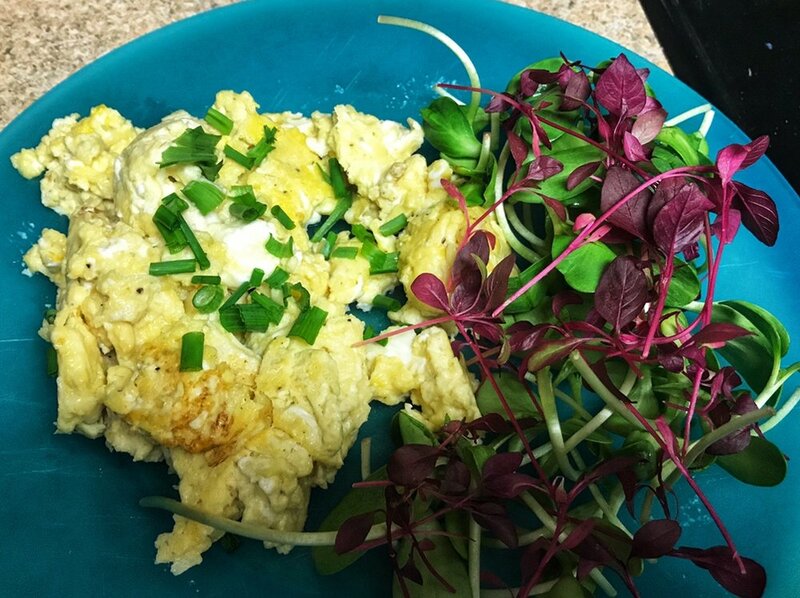 Local scrambled eggs with cheese, garnished with fresh chives and a side microgreen salad from TexSelect Farms of sunflower and amaranth without dressing. Find your local Harvest Hub today.